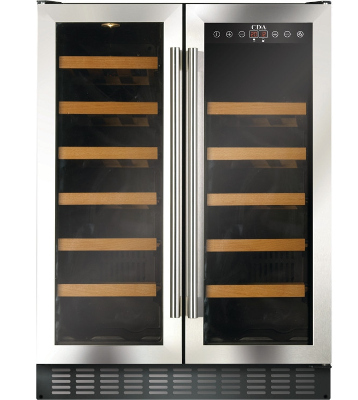 To own a wine cooler is to have a slice of luxury right at home, no matter if you’re an avid collector or simply enjoy a nice bottle (or 2). With summer just around the corner – supposedly - and a tonne of barbeques, weddings and post-work drinks no doubt stacking up on your social calendar, I thought I’d review a couple of these coveted coolers for your perusal. Pains have been taken to give a fair selection of budgets, sizes and features so, whether you’re in the market for a memorable gift or have been hankering to splash a little cash (on yourself, of course), you’re sure to find something to suit every taste. The BW18BL is an ideal choice for the first time buyer. Visually, it’s as sleek a cooler as you would find in any bar and, although it isn’t exactly packed with features, it certainly does the job – and well, price considered. Space for 18 bottles is more than enough for the casual collector (the ranks of which I count myself among) and the smaller dimensions are actually incredibly helpful should you enjoy a more compact living space. One of the recurring concerns when buying this kind of cooler is the extra noise generated, especially if you do suffer from small-kitchen syndrome. The noise levels of the BW18BL were, in fact, one of the first things I noticed about it – or rather the lack of them. A barely audible 38dB of running noise is all this wonderful little beverage centre emits, making it as unobtrusive as it is handsome. Even more impressive still is its thermoelectric cooler. With less moving parts and no cooling liquid necessary, it allows for an entirely stable chilling environment that happily holds whatever degrees you deem best for your prized vino, provided it’s only up to 10°C below the ambient temperature. I wasn’t so keen on the somewhat limited temperature range of this cooler or its lack of family-proof features – think of those lovingly-procured wines at the mercy of small, sticky fingers – but overall, I deem it a very decent deal. Baumatic’s good reputation and the great price tag (at just £110!) help to make allowances for only 1 chilling zone and the lack of flexibility - for those just starting out down the wine-collecting path, it’s a great choice. Next up for appraisal was the FWC623SS, featuring double doors and a super-shiny stainless steel finish bound to bring out the magpie in anyone. This cooler positively oozes class; the understated handle design and gorgeous wooden display shelves are guaranteed to inject ultra-modern style into any kitchen and, able to easily store 40 bottles at any one time, it’s the perfect treat to celebrate a growing wine collection. Most notable – aside from the lustrous exterior – are the dual temperature zones. Split straight down the centre, it provides an individual electronic control for each zone, creating a tailored cooling environment for your prized reds and whites at the very same time. I was even more impressed by the measures put in place to protect the bottles from temperature fluctuation; featuring 2 intelligent humidifiers that maintain a perfect 50-80% RH as well as a memory function and an alarm should the interior temperature rise by any more than a degree, it’s a sure thing that CDA holds your wine preservation at the heart of their engineering endeavours. The triple-glazed, smoked, toughened, UV-protected glass door is (besides a mouthful) the absolute ultimate in light filtration without entering into the realms of serious science, preventing any minute changes in bottle construction and thus protecting the delicate composition of your wine. Even the interior lighting has been carefully considered – 2 strategically placed LEDs make next to no micro-vibrations as well as bathing your cherished bottles in clean, flattering light for perfect preservation and an impressive display. Of course, I found a couple of niggles once I’d recovered from just how pretty this cooler is. An energy rating of B is, whilst not horrendous, not great either and is sure to expand your carbon footprint by half a size or so. It’s also a little louder than its Baumatic associate, emitting up to 43dB – whilst realistically that’s an unnoticeable noise level in daily life, the indistinct vibrations caused by even a small amount of sound are worth bearing in mind depending on the value of your wine. Everything considered the FWC623SS would undoubtedly be a solid buy for any serious collector and at a reasonable £529, there’s everything to like about this stunning contribution from CDA. When the name Miele is mentioned, their reputation for excellence is no doubt the first thing that pops to mind – closely followed by the corresponding price tag. The KWT6321UG is nothing short of premium; everything from its assiduously designed interior to the discreet fascia created to at once integrate into and complete any modern kitchen is achingly stylish, while the ingenious engineering lovingly poured into this appliance justifies every single penny. 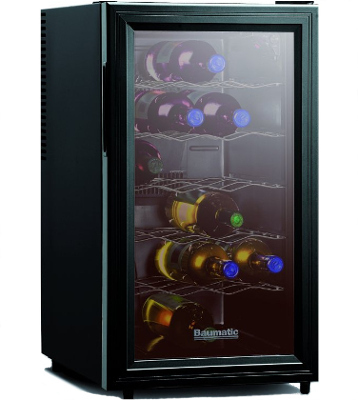 This cooler is a superb showcase for your ardently assembled wine collection. It’s also a rare combination of handsome and smart. I was frankly astounded by the Dynamic Cooling System in place; exclusive to Miele and incredibly intelligent, it achieves an unequivocally stable distribution of air with the help of fan circulation whilst simultaneously offering 3 tailored cooling zones, complete with independent electronic temperature controls, so you can accommodate indiscriminately all of your red, white and sparkling. The aforementioned cooler from CDA uses an (actually very impressive, for the price) humidity control system, but the KWT6321UG has gone above and beyond with unique Active AirClean filters. Using a combination of charcoal and a natural product called chitosan - also used as a fining agent to prevent spoilage in the winemaking process – these filters keep the cooler clear of odours caused by the breathing of wine through the cork, preventing cross-bottle contamination for perfectly preserved, pure flavours. I also thought the specially tinted, UV-protected glass front a great precaution for bottle protection and definitely worth a mention, but please forgive this as an afterthought – I was somewhat carried away by Miele’s deluge of exceptional features. Whilst I’m evidently very much on board with – in awe of? – this cooler, some semblance of a balanced argument must be struck. 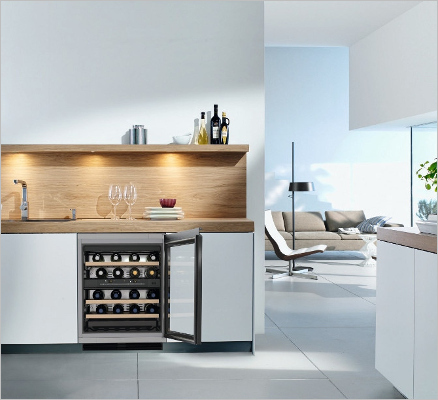 The main stumbling block for Miele products is inevitably their cost; for well over double the price of the CDA (coming in at a cool £1,479) it actually offers less storage, with comfortable room for only 34 bottles across the (admittedly beautiful) telescopic wooden shelving. Aside from this, the only other negative that springs to mind is the decidedly un-eco energy rating of B but that’s almost dismissible – at least, certainly nothing unusual - in the wine cooler market. Overall, I deem the KWT6321UG a serious investment for the seasoned collector and an excellent addition for anyone looking to splash out on a fully-comprehensive modern kitchen.